Feb 13, 2016 one of the original forks of the ZeoCSV demo app has come back to life. I do not intend (at this time) to publish a Zeo app to the Google Play store, this app by Nicholas would be the best for now. It works on my Android 6.0 device without disabling Draw over apps. 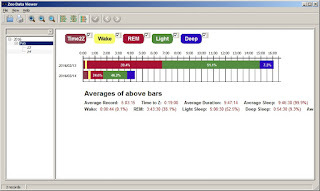 Its key advantage is the CSV format has been updated to work with the "ZeoViewer"
An interesting side effect of this development is once the data is Imported into the ZeoViewer database, it can then be exported into one of three formats CSV, Plain text or Zeo DAT file. The export and import from Android into the Desktop database transfers all records, and persists them in the desktop database. ps. interesting tidbit, the MyZeo apk on Android isn't encrypted or obfuscated, it seems if you wanted to by-pass the application and talk directly to the headband that is something that could be done.